By now, you probably know all the reasons why Tim Raines deserves to be in the Hall of Fame: He was arguably the greatest leadoff hitter this side of Rickey Henderson. He stole over 800 bases at an absurd 85 percent success rate. And, while he came 400 hits shy of 3,000, he has nearly the same on-base percentage as first-ballot Hall of Famer Tony Gwynn. Beyond being a walk machine and a constant threat to steal bases -- like Henderson -- Raines' career went well into his 40s and included a tour through the independent leagues -- also like Henderson. But his career longevity was not without difficulty: Placed on the DL due to a kidney issue with the A's in 1999, Raines discovered that he had lupus, a rare disease in which the immune system turns against the body. It's the kind of thing that would end most careers, and nearly ended Raines'. "As baseball players, we kind of live a sheltered life, good, bad or ugly. I mean, you're on the top of the world. You feel like nothing can ever get to you," Raines said at the time of his diagnosis. "I think what I've gone through over the last three weeks, it's been pretty humbling, because I haven't been able to do the things I love to do and that's play baseball." Eight months after the diagnosis, Raines tried to come back with the Yankees. By March, he admitted defeat and retired, even turning down one last opportunity to pinch-hit. But, he wouldn't stay out of the game long. 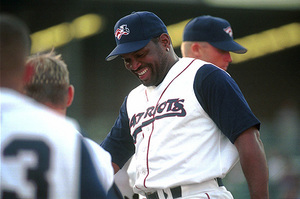 With Team USA looking to add some veterans to the roster for the 2000 Summer Olympics, Raines jumped at the opportunity and joined the independent Somerset Patriots of the Atlantic League to display his skills and shake off any rust. It wasn't enough to make the roster, as Team USA went with an extra pitcher instead en route to a gold medal, but Raines dominated in indy ball, going 9-for-26 with three doubles and two walks. At the time, he wasn't thinking of coming back to affiliated ball again. "My sole reason for playing now is to make the Olympics," Raines said during his stint. "If that doesn't happen, it won't be the end of the world. I've already retired." Despite those claims, it turned out that Raines wasn't finished with the game. When the 2001 season came around, the outfielder was back in the big leagues -- thanks in part to an inadvertent comment he made to then-Expos owner Jeffrey Loria. During his induction into the Expos' Hall of Fame that August, Raines told the Montreal owner he'd like a crack at the 2001 roster. "I'm not sure he thought I was serious, but here I am," Raines said after making the roster as a fifth outfielder/player coach. When he made his return to Montreal that spring, he received a thunderous ovation before his first plate appearance. Just listen to the crowd roar, along with the French radio broadcast. It's deafening. Raines says it's the loudest ovation he's ever heard. We'll have to see if that changes in Cooperstown this summer. They first showed up in a Major League box score together on Oct. 3, 2001, when the elder Raines came on to pinch-hit, but the two played a full game together the next day when Jr. manned center and the Sr. played in left field. Sadly, the two never homered in the same game together, though the elder Raines would hit his final big league home run and drive in three on Oct. 5. Not finished quite yet, Raines added one more team to his resume when he joined the Marlins in 2002. That year wouldn't be nearly as successful, as Raines was largely relegated to pinch-hit duties and hit only .191. That would signal the end of his playing days, but in a career filled with comebacks, it wasn't the end of Raines' time with the sport. After coaching in the Minors, Raines would get to suit up with his son one more time. After taking over as manager for the Newark Bears in 2009, Raines Jr. joined the roster for four games later that summer. Neither lupus, nor roster cuts, or even the advent of age could slow "Rock" down.